On-demand fuel delivery startup Booster Fuels, which operates in Dallas-Fort Worth and the San Francisco Bay Area, says thousands of new users downloaded its app on Thursday. 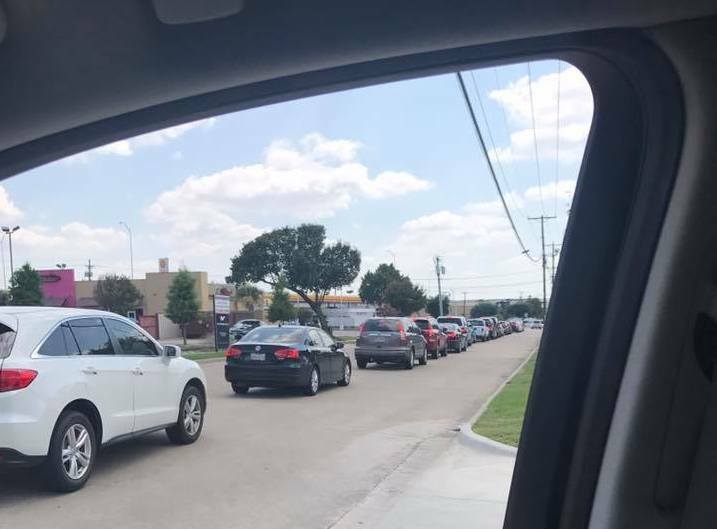 Long lines have formed at gas stations in Dallas and elsewhere as drivers fear fuel shortages in the aftermath of Hurricane Harvey, which struck the heart of the nation’s oil and gas industry in and around Houston, submerging pipelines and shutting down as many as 10 refineries. The capacity reduction comes as drivers prepare to hit the road for Labor Day weekend. The national average price for a gallon of regular gas increased 7 cents from Thursday to $2.52 Friday, a new high for 2017 according to the American Automobile Association. The increases in Dallas were even greater, with prices jumping 15 cents or more in a day. Booster, which has Seattle-area roots and investors and earlier this summer announced a $20 million Series B investment to grow its business refueling cars while they’re parked in corporate lots, “has been working longer, harder hours to help people avoid the gas stations and the obscene lines,” Booster director of sales Ryan Leech tells Xconomy via e-mail, adding that the company has made adjustments to ensure it does not take more orders than it can fill. Leech says Booster’s price per gallon in Dallas on Friday was $2.99 for regular and $3.59 for premium.